The Bruno Cow Tipper 22 is the sweetest sounding amp you'll ever hear. Reminiscent of the classic American Blackface amps, the tone far surpasses even that famous design. This amp is smooth, warm and clean (just try to picture that contradiction in amp design) with a supremely linear gain structure. It is very touch sensitive with superb note articulation and silky sweet clean tones that grow into a rich harmonic crunch as you dial up the volume. The Cow Tipper 22 has incredible harmonic complexity with a rich spacious 2 knob reverb system that really enhances the gorgeous sound. The absolute benchmark in blackface tone in an amp that's the perfect size and volume for small clubs and recording. In fact Tony Bruno tunes and voices the Cow Tipper 22 in two ways: Classic and Jazz specific. 20th Century Guitar Magazine said "The Cow Tipper lived up to it's bovine namesake - big, beefy and juicy without robbing any tonal characteristics away from the instrument, or amp, for that matter. Notes remain full and robust with the attacks being definitive and right on. There's a power amp section workin' here, mates! If you don't think a blackface Fender's tone can be improved upon, think again - Tony's nailed it!" 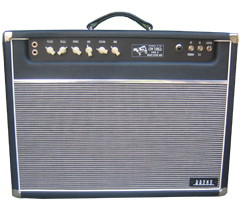 The Cow Tipper 22 features 22 watts of sweet dual 6V6 power, 3 - 12AX7s, 2 - 12AT7s, and a GZ34 rectifier. The cabinet is constructed of solid pine for its sweet brightness and then fine tuned with a birch ply baffle for superb resonance. Finger-jointed construction is used just like the finest furniture which provides a very strong, extremely rigid, rattle free cabinet that will last a lifetime. Other features include premium tolex coverings, padded handles, heavy duty feet, stainless steel screws/bolts and chromed steel corners. The standard finish is Black with an Art Deco style control panel and aged Ivory "chicken head" knobs. Optional custom colors, two tone colors and select hand finished solid hardwood cabinets by custom order - call or email for the price of these options.